The Al Nusrah Front for the People of the Levant, an al Qaeda-linked jihadist group that is fighting Bashir al Assad’s regime in Syria, has claimed credit for four bombings in Aleppo today, including two suicide attacks, that killed more than 50 people. The terror group has now claimed credit for 26 of the 33 suicide attacks that have taken place in Syria since December 2011. The terror group released a statement today on jihadist Internet forums that claimed credit for the four deadly attacks. The statement was obtained and translated by the SITE Intelligence Group. Al Nusrah said it hit four targets, including two hotels, an “Officers’ Club building,” and a “Municipal Palace.” The targets were selected for their military value, according to Al Nusrah. The Officers’ Club was described as “one of the most important and biggest centers” for the Syrian military and the paramilitary shabiha. A “tourist hotel” right next to the Officers’ Club was being used “as a command headquarters for military operations inside the city of Aleppo” and is located in a “security zone.” The Municipal Palace was “turned it into a military barracks” and was used as a sniper nest for regime marksmen. And the Al-Amir Hotel was used by the military as “as a sleeper headquarters for its elements” as well as a a sniper nest. Al Nusrah said that the first attack hit the Officer’s Club at 7:45 a.m. and was executed by a suicide bomber known as Abu Hamza al Shami. The second attack, which took place two minutes later, targeted the tourist hotel next to the Officer’s Club and was also carried out by a suicide bomber, who was known as Abu Suleiman al Shami. The blast was followed up by a suicide assault. Al Nusrah sent in a three-man team “camouflaged in military uniforms” to battle with the surviving Syrian forces. The group identified the members of the suicide assault team as Abu Anas al Shami, Abu Hafs al Shami, and Abu Dujana al Shami. The third attack, which occurred at 8:05 a.m., consisted of a remotely detonated car bomb that hit the entrance of the Municipal Palace. Twenty-five minutes later, Al Nusrah detonated an explosives-laden car that was parked outside Al-Amir Hotel. The Syrian Arab News Agency, or SANA, a news organ of the Syrian Ministry of Information, confirmed that four blasts took place, and claimed that 34 people were killed and 114 were wounded. Other reports indicate that more than 50 people were killed in the attacks. SANA claimed that three of the four blasts were carried out by suicide bombers, and their timeline of the attack roughly matches that of the Al Nusrah account. 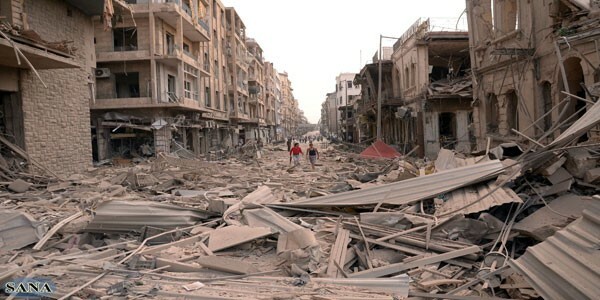 SANA released photographs of the aftermath of the attacks which detail the devastation. The facades of buildings are shorn off, a massive crater is seen at the site of one of the blasts, rubble is strewn through the streets. The bodies of the three members of the suicide assault team are also shown. The Al Nusrah Front has now claimed credit for 26 of the 33 suicide bombings in Syria that the The Long War Journal has tallied since December 2011. Since the end of August, Al Nusrah has claimed credit for launching eight suicide attacks. For more information on the suicide attacks in Syria, see LWJ reports, Suicide bombings become commonplace in Syria , and Al Nusrah Front claims 5 suicide attacks in Syria in past month. Prior to today’s attack, the last complex attack took place on Sept. 26, when an assault team detonated a suicide car bomb outside the Army headquarters in the heart of Damascus. A five-man team then entered the headquarters and battled with security guards. Oct. 3, 2012 – An Al Nusrah suicide bomber detonated a car bomb outside the Officer’s club in Aleppo. Minutes later, a second suicide bomber detonated at the tourist hotel next to the Officer’s club, and then a suicide assault team stormed the hotel.